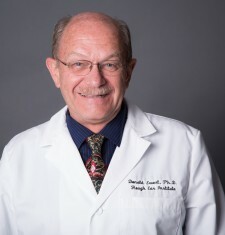 Dr. Ewert received a Ph.D. in microbiology from the University of Georgia in Athens, GA; an M.B.A. in administration from Eastern University in St. David’s, PA (Administration); and he received postdoctoral training in developmental and comparative immunology at University of Alabama in Birmingham, AL. He operated a laboratory at the Wistar Institute in Philadelphia, PA, where he lead a team of researchers in molecular and cellular biology investigating the role of the immune system, endogenous and exogenous viruses, oncogenes in cancer, and normal development of the immune system. He has authored and co-authored over 60 technical papers. Currently at HEI, he is involved in studies to develop pharmacological approaches to preventing hearing loss induced by loud noise or exposure to blasts. Dr. Ewert has served in administrative positions as Director of Research Administration and Resources at The Wistar Institute; Associate Vice President for Research at the Oklahoma Medical Research Foundation, Oklahoma City, OK; and is currently Director of Research at HEI.